Many tourists ask us about the Nightlife in Puerto Pollensa, so today we would like to share with you some great tips about the nightlife in Puerto Pollensa. Here are some of our recommendations for places to go when the sun goes down and sometimes leave when the sun comes back again! 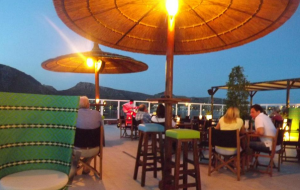 Although Puerto Pollensa is not famous for its nightlife it is a great place to enjoy yourself after dark. 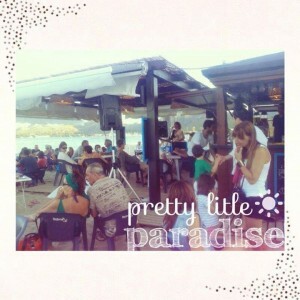 Puerto Pollensa does not have a very exciting nightlife, it is just all nice and cozy. There are no big clubs, but some bars and pubs where the atmosphere seems to be always good. Local knowledge is the key and knowing where to go can make the difference to a great night out. Puerto Pollensa is never packed but always nice and sociable. Holiday makers and locals get together around the MAINSQUARE, NEAR THE PINEWALK and ALONG THE SEAFRONT NEAR THE PORT, where loads of bars and restaurants located are. There is a GREAT ATMOSPHERE in and around the bars, have a drink at one of the terraces or move your feet somewhere inside where especially around the main square you will be able to enjoy some good music! At the main square it nearly always busy with people, terraces are full at bars and pubs like Ohara´s and Tecun. Near the port and along the seafront you will find Norai and Mombasa. Music like pop and rock will be played, check their program for live music. For some karaoke fun visit Nostalgia at the square and if you feel like dancing, discotheque Chiva´s opens their doors until late. Chivas is a small nightclub in Puerto Pollensa, opening late and staying open until the early hours and popular by the younger generation with its loud music and dancing. Just off of the main square. For the ones who are looking for more intense nightlife, Alcudia is nearby and offers loads of bars and discotheques. Popular places in Alcudia are; Shamrock, Unik, Banana Club, Café Milano, La Nit Music Bar. A taxi from Puerto Pollensa to Alcudia costs about € 15 one way. At least one night of your holiday needs to be wild, don´t you think so? For a great night out where you will meet loads of people, go to MAGALUF! Magaluf is the place-to-be for party animals, a resort with loads of bars and clubs and situated in the south of Mallorca. The perfect – and only – way to get there is with the MAGALUF PARTYBUS from No Frills which is going from Puerto Pollensa every Wednesday and Friday! A bus that takes you there and back the next morning, a bar crowl with all the party people on this bus. Then, you will be able to go where ever you like! Feel free and visit as many bars and clubs as you like. Also, you will find one of the BIGGEST DISCOTHEQUES in Magaluf where famous dj´s play their music, where great shows are given and where you will have free bar! All you need for an awesome night out! You can book online your Magalluf Party bus or you can visit the Nofrills Excursions office. 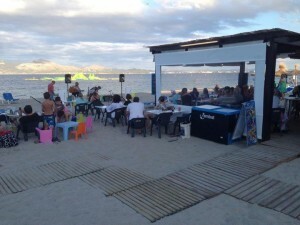 There is one lounge chirinquito on the beach in Puerto Pollensa, opposite hotel Uyal. This place is called Embat and offers a relaxing atmosphere with a great view, perfect for a delicious drink while having your feet in the sand. 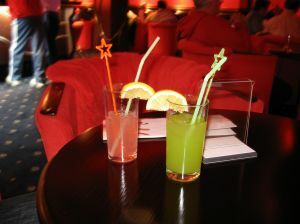 Right in front of the Hotel Daina you´ll find the Lemon Lounge. Along the seafront near hotel Romantic there is a bar called Seabaris. Both great places to chill out and relax with the bay of Puerto Pollensa in front of you. 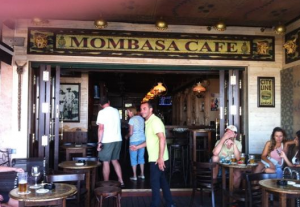 Mombasa isn’t an average bar, thanks to its lively decor and African theme. Its humble surroundings attracts tourists and locals alike. Located right on the very beach front it’s in an ideal location to relax with a drink. The Mulligans Irish bar is popular by many too, just off the main square. Feel free to come to visit us at our office in Puerto Pollensa for updated information about nightlife in Puerto Pollensa because every week there is a new place to go, a new pub opened, something new to do, and our staff who lives in Puerto Pollensa is a great source of information.